I had the task of writing myself a letter, which would be sent to me at an undisclosed time in the future (part of an arts/culture experience in my city). It was a few weeks after my wedding so I ended up writing to myself about the day, in a selfish attempt to keep it fresh in my mind and preserve the memory. This was about two months ago and I just received the letter back, and it was really lovely to read. 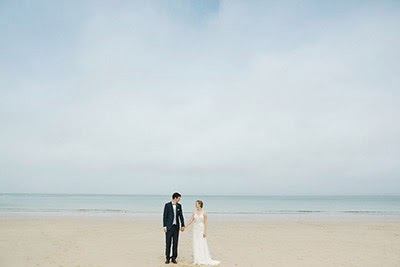 You got married to a wonderful man on the seaside in Cornwall a few short weeks ago. You were uncharacteristically relaxed on the morning of the wedding. B gave you a pill to help you sleep the night before. You felt it make your eyes go heavy, but your brain spun, not for too long though, and then you were asleep. In the morning everything went smoothly; you were the vision of calm. The bridesmaids were a great distraction and they made you feel spectacular. Remember that – you felt great, and calm, and ready. His eyes were welling up when you came down the aisle, and you could sense the overwhelming joy and pride in his gaze. Your heart beat a bit faster. You couldn't stop smiling. Your legs felt a little bit wobbly. You were nervous people would see them shaking slightly under your dress. You loved saying the vows, you loved staring into C’s eyes. It was the best moment. And the wedding was filled with so many wonderful moments. Being surrounded by friends and family. The way everyone cheered when you were announced into the reception room. Swirling around the dance floor to Stevie Wonder. Excitement and laughter. This one seemed perfect for Thanksgiving week. xooo to all of you. The day after my wedding, I typed up all my memories. It's fun to read back on now, especially since my feelings (completely overwhelmed) don't quite match the pictures (sheer joy). :) Definitely recommend this! Writing about how you felt on that day would serve its purpose when it is read in the succeeding years of the marriage. Our emotions during that moment should eclipse that of the almost-maddening ride of wedding planning. And also, in the next years, if in case you veer off from your vows (hopefully not), you have something to go back to.